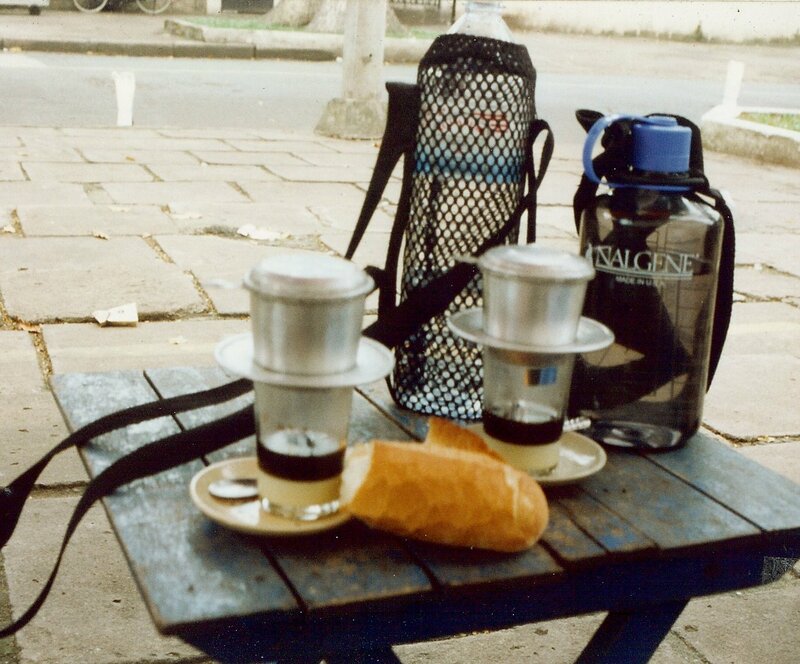 Cafe Sua served on the streets of Ho Chi Minh City. Once stirred it becomes a caramel colored sweet coffee drink. Café Sua might not be a term you’re familiar with, but they were the two most important words I learned while in Vietnam last month. It’s their strong black coffee mixed with sweetened condensed milk. That sounded too sweet to me (I don’t like sweetened coffee), but applying “when in Rome” to my Vietnam experience I ordered one & fell in love with this sweet combination. First of all it’s a process experience. Coffee is dripped into your glass with the sweetened condensed milk already in it…that’s right, a glass so you can watch the drip, drip, drip of your coffee (sort of like watching a lava lamp). See the photo of the process taken at a street café in Ho Chi Minh City (formerly Saigon). The 2nd photo is of the kit for sale through Saigon Coffee at the farmers markets listed above. Saigon Coffee offers the cold version at their farmers market stalls. Most local Vietnamese restaurants will have Cafe Sua on their menu, served cold or hot. If you want yours cold ask for Café Sua Da. You might also enjoy it with a fresh spring roll or pho, a Vietnamese noodle soup. 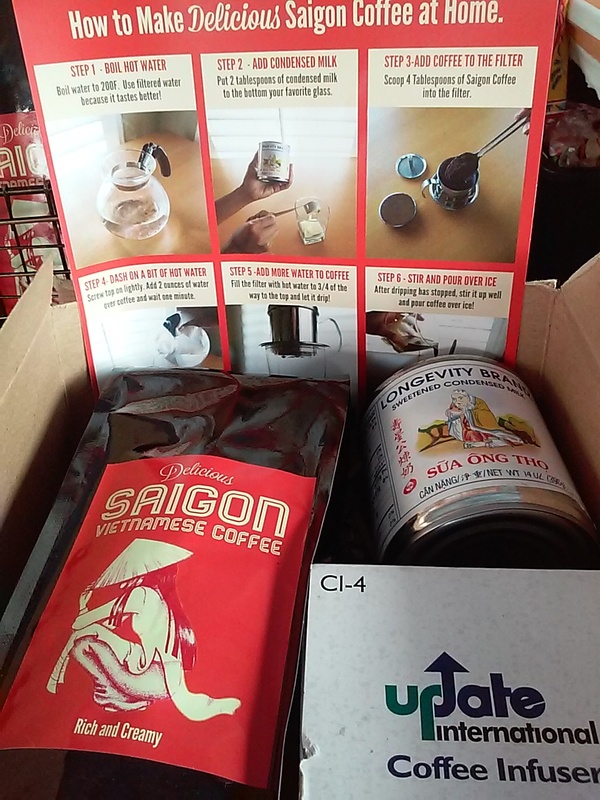 A cafe sua kit available through Saigon Coffee. Step-by-step directions are included. If you can’t make it to one of the farmers market listed above, email saigoncoffee.co@gmail.com to order coffee or their Café Sua kit by mail. It’s a whole lot cheaper than an air ticket to Vietnam, although not as much fun! This entry was posted in farmers market coffee, Vietnamese coffee and tagged Hillcrest Sunday Farmers Market, Ocean Beach Farmers Market, Vietnamese coffee. Bookmark the permalink.